Aereo's future: Online cable provider? Aereo may get a second life if it succeeds in reinventing itself as a cable company that legally delivers channels via the Internet. At least that's what it's trying to do, according to a legal filing on Wednesday. But it will need a court to rule in its favor before it can move forward. The Supreme Court ruled against the startup last month, prompting Aereo to suspend its streaming TV service in what it called a temporary pause "as we consult with the court and map out our next steps." 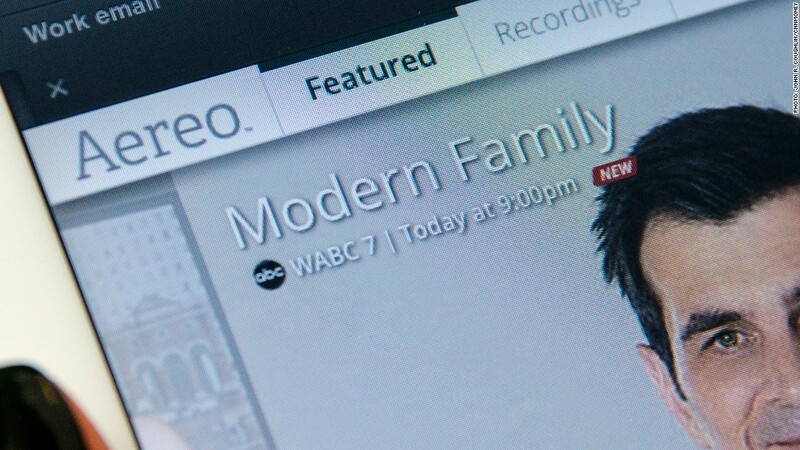 Aereo previously streamed local TV stations to paying subscribers' phones, computers and other screens. It avoided paying retransmission fees to those local stations by scooping up the stations' signals with arrays of antennas in each market it operated in. The start-up asserted that this was legal because each subscriber was assigned a different antenna. But the nation's biggest broadcasters sued Aereo for copyright law violations, and the Supreme Court sided with them. Because the Supreme Court ruled during the preliminary injunction phase, the case was handed back down to the New York district court where it originated. So what's Aereo going to do now? It previously argued that it was not a cable provider and shouldn't be treated like one. The broadcasters agreed with that. But now, according to Wednesday's filing, it does want to be treated like cable. Aereo's attorney cited statements from the Supreme Court ruling that the service is "substantially similar to" and "is for all practical purposes a traditional cable system." "As a cable system, Aereo is now entitled to the benefits of the copyright statutory license," attorney David Hosp wrote. He said Aereo is now "proceeding to file the necessary statements of account and royalty fees." These steps could help Aereo gain the legal rights to retransmit channels, albeit at a significant cost to the company and its subscribers. A number of other companies, some big and others small, are also exploring how to sell a cable-like bundle of channels via the Internet in a way that's more customer-friendly than the bundles that most American households currently buy. None have actually launched yet. Back when it was still up and running, Aereo took one small step in the direction of becoming a cable provider by including a live stream of cable news channel Bloomberg TV in its bundle of local TV stations. Aereo described it as an experiment at the time. The broadcasters' attorney, Bruce Keller, called it "astonishing for Aereo to contend that the Supreme Court's decision automatically transferred Aereo into a cable system" because the service previously said it was not a cable system. Separately, Aereo also signaled that it sees an opportunity as a time-shifting TV service; the Supreme Court, it said, did not rule against the digital video recorder playback of shows later, only Aereo's "near simultaneous transmission" of those shows. It is unclear when the district court judge will weigh in on the issues presented by Aereo and the broadcasters. A spokeswoman for the start-up declined to comment. "We have no idea how soon the New York District Court will come back and rule on yesterday's joint letter, but there could still be significant industry ramifications to both broadcasters, distributors and technology companies," BTIG analyst Richard Greenfield, a vocal supporter of Aereo, wrote in a blog post Thursday.